in the heart of the Botswana bush. Thobolo’s Bush Lodge is a wildlife oasis in the heart of the bush. Thobolo’s Bush Lodge offers spectacular game viewing and is the perfect retreat for visitors travelling between Chobe, Savuti and Moremi. 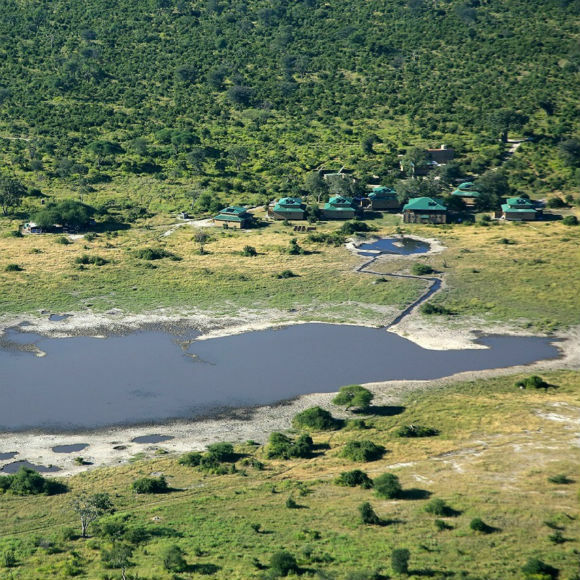 Home to a large number of species including elephant, buffalo, zebra, lion, leopard, wild dog and much more. 12 well appointed chalets and a spacious campsite overlooking the magnificent Barangwe Pan. Thobolo’s Bush Lodge is conveniently located between Chobe, Savuti and Linyanti. On-site braai and kitchen facilities, as well as freshly prepared delicious à la carte meals to order. Positioned on the magnificent Barangwe Pan, Thobolo’s Bush Lodge has been built using the greenest methods available. Offering a spacious campsite and 12 well appointed chalets, available on either a self-catering or full board basis. We are perfectly positioned for game drives in Chobe National Park, Savuti, Linyanti and beyond. An inexhaustible, enthusiastic source for nature and animals. And animals have it! 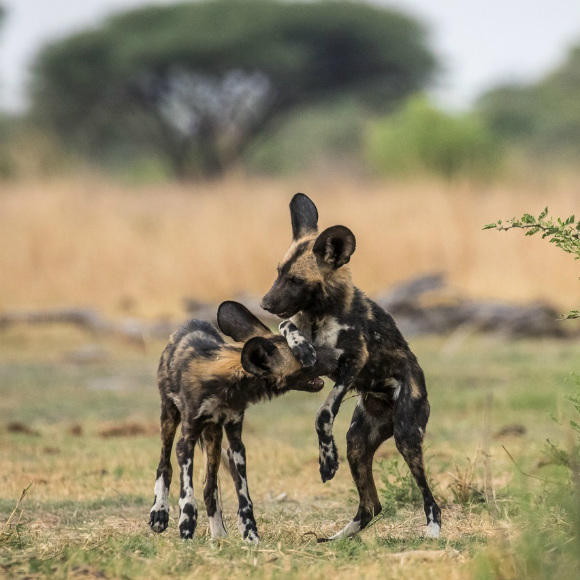 In front of the entrance we met African Wild Dogs, in the evening the buffaloes were there (between 500-700 pieces), behind them the sinking sun. Here you can spend the whole day and watch the drifting at the waterholes. We will be back! Thobolo’s is an absolute gem, and we feel so lucky to have camped here for two nights (originally intended a single night, but we loved it here so much, we returned for a second). The camp sites are great with the best bathrooms/showers we saw during our whole trip. The real highlight of Thobolo’s though is the blind overlooking the watering hole(s). Tons of animals coming through for a drink at all hours of the day. This is an amazing place, and the best place I stayed at during my time in Zambia and Botswana. The lodges are spacious, modern, comfortable and spotless. 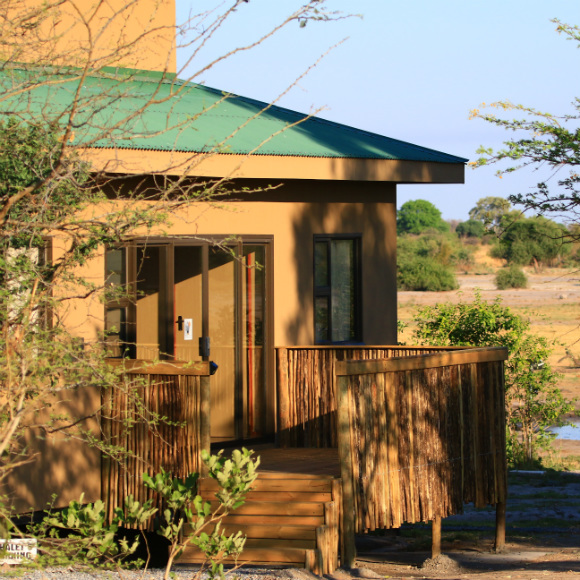 The common areas are beautiful, and the deck overlooking two pans is the best place for game viewing. Giraffes, elephants, buffalo, zebras just pass by. The whole setting is really extraordinary. I will be back! We had such an awesome time at Thobolo’s! The upper view deck is the perfect spot to view game. Our kids, 9 and 10, loved sitting there and watching the herds of buffalo’s drinking, the zebra’s passing and many more game. We stayed at the campsite, which is near the main camp. It’s unfenced, so at night we heard the elephants breaking branches and the lions roar! We enjoyed breakfast, dinner and even lunch at the main lodge; the food is delicious; a true hidden 5* gem in the bush! The home made bread is to die for! Highly recommended!! The location is outstanding overlooking a waterhole where you can watch wildlife drink, including herds of elephants, zebra, buffalo and the odd lion. This is an eco lodge and is true to its name with its philosophy of leaving as small a carbon footprint as possible. We stayed here only one night unfortunately but I wish I stayed here a whole week! The welcoming was astonishing, our hosts are passionate people and make you learn a lot of interesting things about nature and how it’s preserved in Botswana. This is the best accommodation have ever been. Keep up the good work guys! This lodge is perfectly located between Chobe National Park, Linyanti and Savuti, making it the ideal place for the serious wildlife enthusiast. I highly recommend Thobolo’s Bush Lodge.